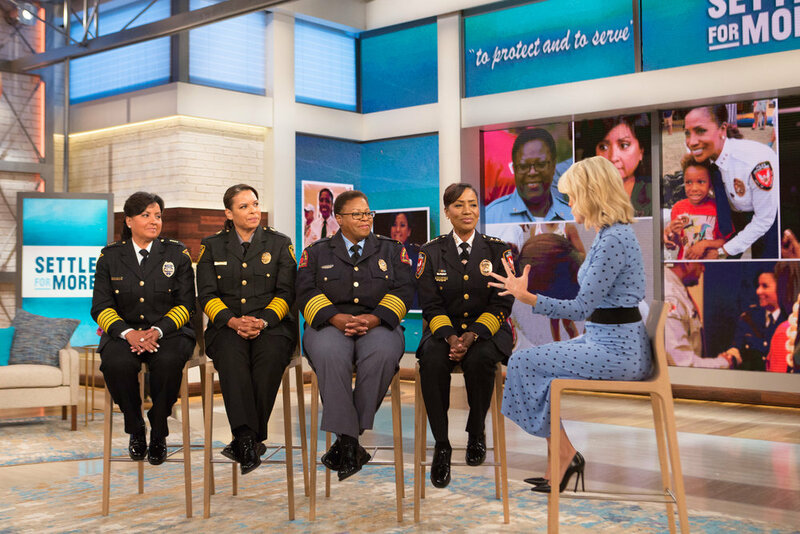 NBC News‘ new block of “Today,” “Megyn Kelly Today,” debuted Monday using its sixth floor studio’s video walls to create an open feel and enhance storytelling, a colorful open and graphics inspired by the show’s logo. “We didn’t set out for the Megyn Kelly studio just to be a continuation of 1A, we really wanted to do something unique and specific for her,” Marc Greenstein, vice president of design for NBC News and MSNBC told NewscastStudio. During Monday’s debut, the show made generous use of the surfaces to create bright and cheerful Central Park backgrounds as well as to help drive editorial content. For example, during a segment on the upcoming revival of “Will & Grace,” producers used the large video walls to their full advantage — with the show’s logo and photo montage of scenes from the sitcom being fed to various panels and a wide view of Will’s apartment in the two central screens, which served as the primary background behind the stars of the show during the interview. 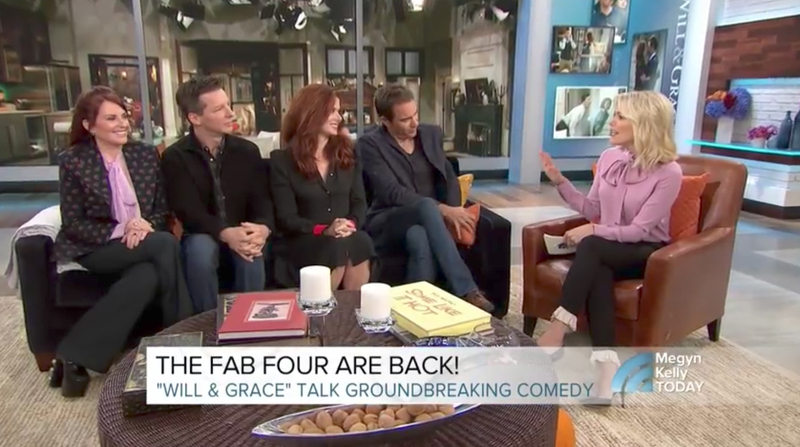 The show also brought in some of the Will & Grace furniture for the segment, a somewhat ironic move given that Studio 6A’s renovation came stocked with numerous seating areas. 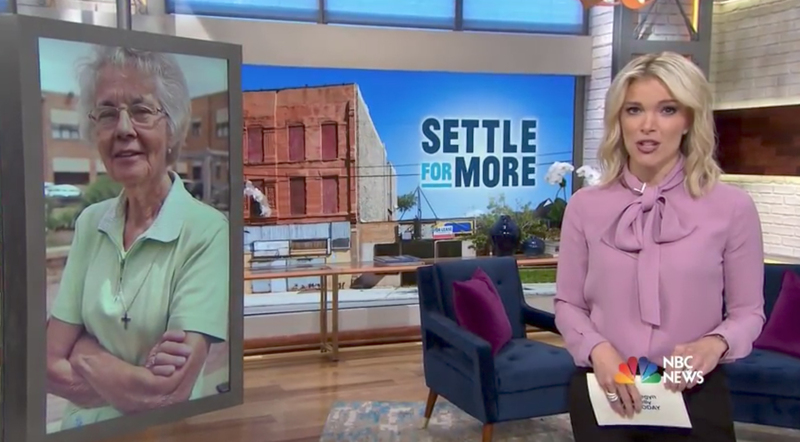 During a segment with the rest of the “Today Show” team welcoming Kelly to NBC dayside, two of the set’s larger video panels were retracted to reveal additional faux white brick walls and an entryway. Guests, meanwhile, entered the studio through an opening camera right with a semitransparent sliding door. 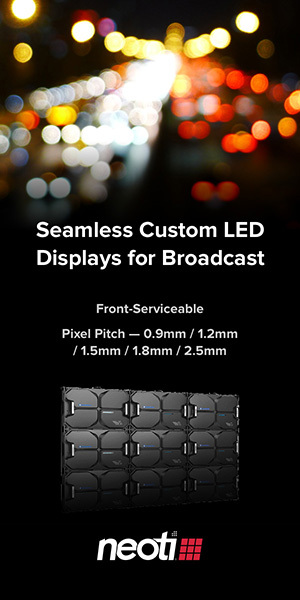 The video walls and a movable, ceiling mounted vertical panel were also used to introduce longer form packages. 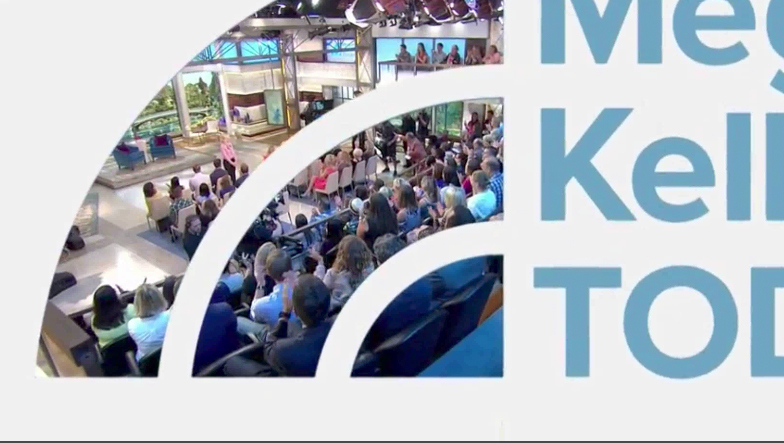 The show’s lower third insert graphics, which were primarily a clean white with matching sans serif typography, accompanied by an animation using the arches found in the show’s logo icon, which itself is half of the “Today Show” logo colored a blue shade. 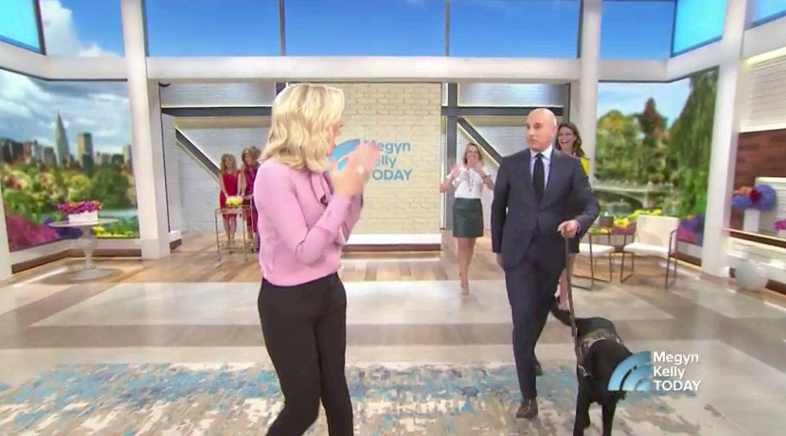 Throughout “Megyn Kelly,” the logo appeared in the lower right of the screen, transitioning between that and the NBC News logo. 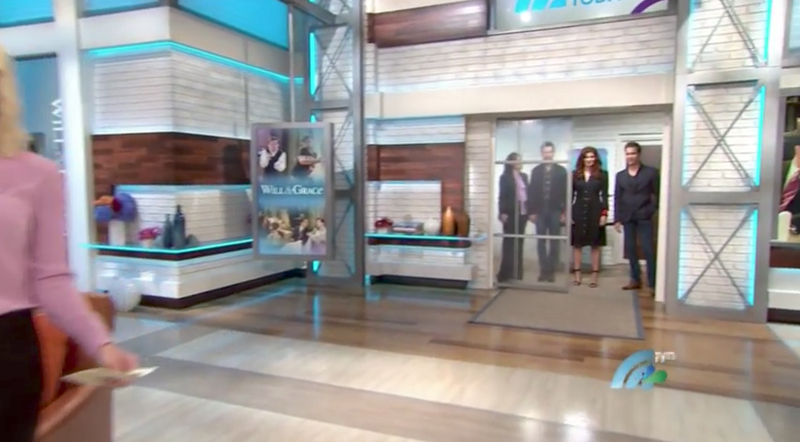 The show open used a combination of clean whites, blues, violets and gold accents blended with stylized studio shots of Kelly, with the arches of the “Today” sunrise making frequent appearances, including as a negative cutout look in both the lower thirds and as a transitional element to a wide shot of the studio. The look of Studio 6A largely matched that of the open — with clean white and grays accented with silver girders and the faux white brick accented with dark wood tones and backlit panels. The studio audience was, as Greenstein promised, brought in close to the action through the use on-floor seating and wide, sweeping shots showcasing Kelly standing in the middle of her audience. Splashes of color and texture were incorporated into the design, from Jack Morton PDG, through the use of upholstered furniture, accessories and an abstract ribbon-like light fixture camera left. The look borrows elements from other NBC properties, including the “Today Show” itself and the network’s fourth floor newsroom — namely the warmer touches and exposed brick look — as well as the recently updated “NBC Nightly News” studio’s generous use of LED walls. The strong diagonals found in the girders also echo some of the lines found in the headers of Studio 1A and the wood tones mixed with the whites and silvers, while not an exact match, also echo the look found on the “Nightly” set.